Complete Streets is the integration of people and place in the planning, design, construction, operation, and maintenance of transportation networks. Do you know of a project, plan, event, person, committee, task force, etc. that exemplifies Complete Streets? Fill out the brief nomination form below! 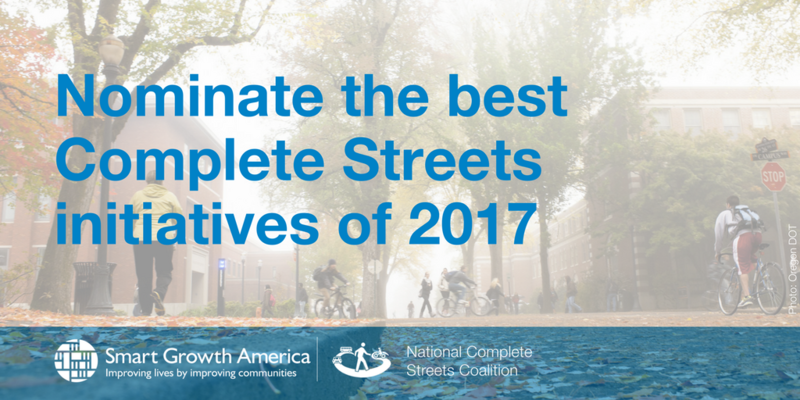 The selected winners of the best Complete Streets initiatives will be featured in the Best Complete Streets Policies of 2017 report. Our new policy grading rubric will take effect beginning with all policies adopted in 2018. The new framework requires greater accountability from jurisdictions for implementation and provisions to include the needs of the most vulnerable users. We want to highlight and showcase initiatives that are already setting an example.